Bored with getting haircuts every few months and deciding to let my hair grow long, I suddenly found myself with little piles of new barrettes and elastic cords to tie the mop back. Not about to do anything as dramatic as cough up dough to purchase containers for them, I cruised around the apartment searching for some storage ideas. Aha! Little glass candle holders — perfect. After dumping a whiskey shot glass I had been using to hold a few old bobby pins, I consolidated the pins and barrettes into the candle holder and collected the corded bands into a heart shaped lacquer box I had been using in the studio for pencil shavings. These went into my straw make-up box, which had started life as a napkin holder. Many storage containers in my apartment have done double, triple and more duty stashing all kinds of items never designed for them. This includes the large gift bag on my bathroom floor — now clipped shut, enclosing goodies I prefer storing in private. Obsolete silver cigarette box transformed into earring box. Heirloom stemmed pink glass reborn as a napkin holder. Tightly lidded food jar now showing off my Cape Cod seashell collection. Upbeat, brightly colored gift box that’s lasted an amazingly long time as a pencil-office-tool box. Large unused cardboard clothes storage box confiscated to contain over-flowing collection of movie cassettes, currently sitting under living room bookcase awaiting an outer covering more living-roomish than girly pink flowers. Old pewter porringer placed beside a window to catch the sparkles in my collection of quartz and other richly textured stones. Silver bowl now encasing the unique gift of a “witches ball” a large, hand blown glass ball designed to hang at a window or door to keep witches from intruding. Not trusting my ancient brownstone ceiling enough to hang the ball from it (rightly so; it has since partially collapsed), I wanted the ball at a safer lower altitude. And even though it’s not correctly positioned, the intricately colored ball has definitely kept witches from popping in uninvited. English tin candy box in the shape of a Trafalgar Square double Decker bus with a top coin slit for it’s apparent intended afterlife as a bank, but which instead has become a roomy depository for my paper clips and elastic bands. Straw basket with large handle that originally arrived here filled with fresh flowers and that’s now filled with toiletries on my bathroom shelf. Having happily served its’ first purpose, a wine bottle is now serving its reincarnation as a corked container of dry beans. Mason jars functioning as transparent — and practical — kitchen canisters for sugar, tea and rice. 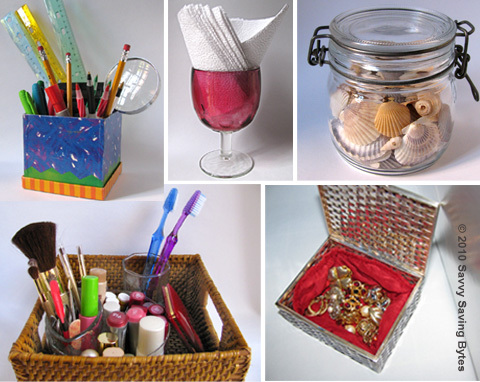 If you too have any unruly items that need taming and consolidation, why not take a spin around the house to check out any items that could be given new life as zero cost storage containers. I like the idea of turning old cigarette box into a jewelry box. Think I’ll turn mine into a ring box. Welcome! Some of those old cigarette boxes were much too handsome to give away. It’s good to see them put to practical use. I liked the ideas!!! I’ll copy them! Thanks! Glad you found them useful. Let me know how they turn out.